It’s time! Time for another Christmas giveaway from ChristmasGifts.com before the new year! The giveaway will be from CaddyCap, and will be a must-have for any golf lover, no matter if they are beginners or experts. If chosen, you will receive a gift card for $50. Read the contest rules below to find out how to enter and hopefully be lucky enough to win! 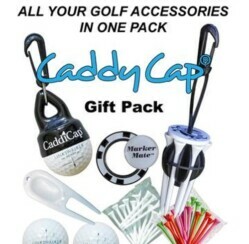 CaddyCap is a one stop collection of all of the golf game accessories you can think of, from the patented tee holder that is made in the United States to the handy golf ball holder – all stored in a convenient place and ready to use. While the MarkerMate™ is included, it’s important to note that it does not come customized. If you would like each side customized, please visit the two sites listed below that perform the service. Enter to be the lucky winner, and receive a gift card so that you can snag this great little golf accessory! Go to our website at ChristmasGifts.com. Browse the gifts and find one that you really like. Click on the gift, then scroll all the way down to the comment section, and leave a comment telling us why you like it, who you would buy it for, what you would use it for, etc. That is it! You’re entered! Maximum of 5 entries per person. One winner will be drawn at random.